© 2009 Plant Management Network. Accepted for publication 26 May 2009. Published 11 August 2009. Tisserat, N., Cranshaw, W., Leatherman, D., Utley, C., and Alexander, K. 2009. 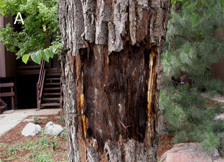 Black walnut mortality in Colorado caused by the walnut twig beetle and thousand cankers disease. Online. Plant Health Progress doi:10.1094/PHP-2009-0811-01-RS. Since 2001, widespread mortality of black walnut (Juglans nigra) has been reported in Colorado, USA. Affected trees initially show a yellowing and thinning of leaves in the upper crown, followed by twig and branch dieback and ultimately tree death. We report that this mortality is the result of a combination of an expanded geographic range of the walnut twig beetle (Pityophthorus juglandis), its aggressive feeding behavior on black walnut, and extensive cankering caused by an unnamed Geosmithia fungus associated with the beetle. Geosmithia was consistently recovered from the bodies of P. juglandis and this insect introduces the fungus into healthy trees during gallery formation. This is the first report of Geosmithia as a pathogen of black walnut. We propose the name Thousand Cankers to describe this disease because mortality is the result of bark necrosis caused by an enormous number of coalescing branch and trunk cankers. A second pathogen, Fusarium solani, was isolated from the margins of elongate trunk cankers during the final stages of decline, but not from cankers surrounding beetle galleries. Thousand Cankers Disease is eliminating black walnut along the Front Range of Colorado and poses a grave risk to this species in its native range in eastern North America should the insect/Geosmithia complex be introduced. Black walnut (Juglans nigra) is one of the most highly valued timber species in North America (8). The wood is prized for use in cabinetry, gunstocks and other finished wood products. The nuts are also an important nutritional source for wildlife. Black walnut is native to eastern North America, and is widely distributed on deep alluvial soils from New England and the Appalachian Mountains west to the Great Plains and from the Canadian border south into Texas and into the Florida panhandle (8). It has been widely planted outside its native range in the western United States as an ornamental and timber tree, and for nut production. As early as 2001 arborists and foresters in Boulder and Colorado Springs, Colorado noted decline and mortality of black walnut. Affected trees initially showed a yellowing and thinning of leaves in the upper crown, followed by twig and branch dieback (Fig. 1). Over a period of several years, progressively larger branches were killed and affected trees eventually died. Trees typically were killed within two years after initial symptoms developed although smaller trees (< 10-cm diameter at breast height), or those growing on sites prone to drought stress, declined more rapidly. 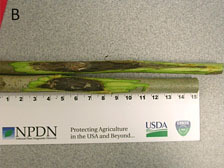 Basal sprouts often developed on trees in advanced stages of decline, or from stumps of removed trees, but these sprouts also wilted and died within one or two years after emergence. Fig. 1. Symptoms of thousand cankers disease in Juglans nigra: (A) Yellowing of leaves and branch dieback during early stages of disease; (B) extensive branch dieback; and (C) wilting and collapse of entire crown prior to death. Note that the bark on branches and trunk remains firmly attached even in final stages of disease and there is no external evidence of cankers. By fall 2008, over 700 trees were killed and removed in Boulder alone, representing the majority of black walnut in that municipality. Similar mortality rates occurred in Colorado Springs, which now has few surviving black walnuts. Tree decline is now occurring in several communities in the Metro Denver area. The disease was also observed on black walnut in the city of Delta approximately 400 km west of Denver. 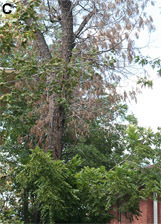 Black walnut mortality was initially attributed to a drought that persisted from 2000-2003. However, tree deaths commonly occurred at sites receiving supplemental irrigation, and mortality rates accelerated after annual precipitation returned to normal in 2004. This suggested an alternate cause for the unusual tree mortality. We report here on the association of the walnut twig beetle and the canker fungi Geosmithia and Fusarium solani with mortality of black walnut in Colorado, and the potential threat this disease complex could have on black walnut if it were introduced into the native range of this tree species. Pityophthorus juglandis is a minute (1.5 to 1.9 mm) yellowish-brown bark beetle. It is one of only a few species in the genus Pityophthorus that is associated with hardwoods and the only one associated with Juglans (7). It can be readily distinguished from other members of the genus by several physical features (Fig. 2). Among these are 4 to 6 concentric rows of asperities on the prothorax, usually broken and overlapping at the median line. The declivity at the end of the wing covers is steep, very shallowly bisulcate, and at the apex it is generally flattened with small granules. Fig. 2. (A) Gallery formation caused by walnut twig beetle adult in Julgans nigra branch. (B) Extensive tunneling in inner trunk bark caused by walnut twig beetle adults and larvae. Note the extensive discoloration surrounding galleries caused by Geosmithia. (C) Walnut twig beetle, side view (Photograph by Jim LaBonte, Oregon Department of Agriculture). (D) Walnut twig beetle, top view (Photograph by Jim LaBonte, Oregon Department of Agriculture). The walnut twig beetle is apparently native to North America and was originally described in 1928 from a collection in the area of "Lone Mountain," New Mexico, near Silver City in Grant Co. (1). Wood and Bright (19) reported the insect from Juglans in New Mexico, Arizona, and Chihuahua, Mexico, a distribution that largely coincides with Arizona walnut (J. major). The walnut twig beetle was also recovered from both black walnut and southern California walnut (J. californica) in Los Angeles Co. in 1959 (2). The walnut twig beetle was first associated with black walnut mortality in the Espanola Valley of New Mexico in 2001 (15). The beetle was subsequently collected in Boulder and the adjacent community of Westminster, CO in 2004 and in Colorado Springs in 2005 on declining black walnut (16). Prior to these reports, the walnut twig beetle had never been associated with any significant Juglans dieback or mortality. Drought was originally suspected as the cause of the decline and death of trees, with the beetle as a secondary pest. The life cycle of this insect has not been fully determined. Despite its small size, attacks by adult walnut twig beetles are not confined to small diameter twigs. In fact, the minimum size of infested limbs was approximately 2-cm diameter and tunneling regularly was found in branches of 10-cm diameter or larger and even in trunks of large trees, a behavior considered unusual for this genus. Results of sticky panel trapping in Boulder during 2006 indicated a flight of adult beetles from late April through October (data not shown). 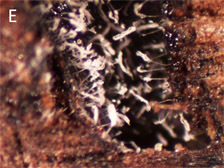 Initiation of adult tunneling was observed in the field during early May and a single generation was completed within 7 weeks in infested logs held at room temperature. This suggests that two or more generations are completed annually in Colorado and that they overlap. Two different cankers were observed on declining walnut trees. In the early stages of tree decline, small, roughly circular to oblong cankers developed around P. juglandis galleries in twigs, branches and even the trunk (Fig. 3). Cankers were usually not visible until a thin layer of outer bark was removed. 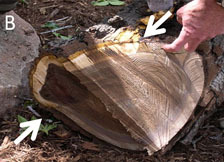 In some cases, a dark amber stain formed around the beetle entrance hole on the bark surface. Bark cracks sometimes formed near galleries on small diameter branches giving them a rough and somewhat bumpy appearance. Nevertheless, branches with numerous beetle galleries and cankers often showed no outward appearance of bark damage, except for the small beetle entrance holes, even when leaf wilting was present. Fig. 3. Cankers caused by Geosmithia are visible only after the outer bark is removed: (A) oblong to elliptical cankers surround galleries of the walnut twig beetle; (B) coalescing cankers eventually girdle the branch resulting in dieback; and (C) multiple cankers caused by Geosmithia developing on the trunk approximately 1 m from the ground. Cankers surrounding the beetle galleries in thicker-barked branches or the trunk often were initially restricted to the phloem and outer bark and did not extend into the cambium. With time, cankers expanded in the phloem and outer bark, became more diffuse, and caused a dark brown to black maceration of the tissue. Cambial discoloration was observed only after extensive bark colonization by the fungus had occurred. 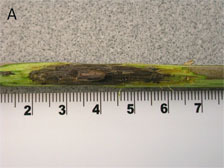 Beetle galleries and associated cankers often were scattered every 2- to 5-cm in bark during advanced stages of decline. Thus, the total number of cankers on each declining tree was enormous. Eventually multiple cankers coalesced and girdled twigs and branches, resulting in dieback. A dusty, white to tan fungus was often found in the insect galleries and on adult beetles that had died in galleries (Fig. 4). Fig. 4. (A) Colony morphology of Geosmithia on ½-strength potato dextrose agar; (B) colony morphology on reverse side of plate; (C) verticillate conidiophores and conidia; (D) conidiophores on elytra of dead walnut twig beetle excised from gallery; and (E) Geosmithia sporulating in walnut twig beetle gallery. A second canker type was observed on the trunks of five dissected black walnut trees in advanced stages of decline. These diffuse cankers were much larger and more continuous than those observed on branches during the early stages of the disease. Trunk cankers often exceeded two meters in length, extended from the ground into the scaffold branches, and sometimes encompassed more than half the circumference of the trunk (Fig. 5). The bark remained firmly attached to the trunk such that cankers were not visible without first removing the outer bark. On some trees a dark brown to black stain on the bark surface or in bark cracks indicated the presence of a trunk canker. The inner bark and cambium were water-soaked and stained dark brown to black. The wood adjacent to the cambium was also stained. Walnut twig beetle entrance holes were present in bark crevices, and tunneling was observed beneath the bark surface in the canker face. In addition, small round entrance holes (2 to 3 mm) of the exotic ambrosia beetle Xyleborinus saxeseni Ratzeburg were sometimes observed in sapwood beneath the trunk cankers. Fig. 5. (A and B) Bark has been removed to reveal the elongate, diffuse trunk cankers that develop during the final stages of the disease. 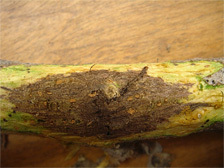 Geosmithia was consistently isolated from the discolored bark whereas both Geosmithia and Fusarium solani were isolated from the cambium at the canker margins. 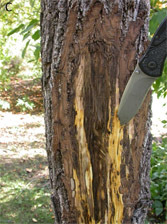 (C) Extensive bark and cambial necrosis on trunk at a height of 1 m. Approximately ¾ of the trunk circumference (clockwise from top to bottom arrow) has been killed. Branch and trunk samples with cankers were collected and the outer bark was peeled back with a sterile scalpel to expose diseased tissue. Small bark chips approximately 5 to 10 mm long and 3 to 5 mm wide were removed from canker margins and placed directly on ¼-strength potato dextrose agar amended with 100 mg/liter strepotomycin sulfate and 100 mg/liter chloramphenicol (¼ PDA++). 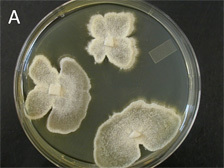 Emerging fungal colonies were transferred to ½-strength PDA. Twelve adult walnut twig beetles were excised from their galleries in branches on three trees and placed directly on ¼ PDA++ without surface disinfestation. A fungus was consistently isolated from canker margins, from discolored phloem lining beetle galleries and from beetles removed from galleries on branches and the trunk. 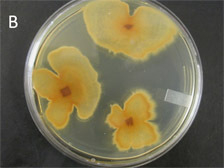 Fungal colonies on ½-strength PDA were cream-colored to tan, and tan to yellow-tan on the reverse side of the plate (Fig. 4). The fungus initially grew very rapidly out of the wood chips and colonies commonly exceeded 20 to 40 mm in diameter after 3 to 5 days at 25°C. However, colonies generally were attenuated (< 20 to 30 mm diameter after several weeks) with appressed margins following successive transfers on ½-strength PDA. 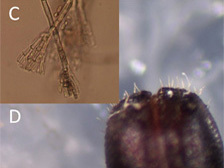 The fungus sporulated profusely in culture producing dry conidia on multi-branched, verticillate, verrucose conidiophores. Conidia were tan en masse, cylindrical to ellipsoid, 2-6 × 6-14 µm (mean 2.7 × 6.5 µm), and formed in chains. Morphological characteristics of the conidiophores and conidia were consistent with those described for the genus Geosmithia (11,12,13). In addition to Geosmithia, Fusarium solani (Mart.) Sacc. was consistently isolated from cambial tissue collected from the margins of trunk cankers during the final stages of the disease but not from cankered bark tissue surrounding walnut twig beetle galleries on branches. DNA was extracted from two putative single spore isolates of Geosmithia (1217 and 1218) grown on modified yeast extract broth for 10 days. DNA amplification of the ITS1, 5.8S, and ITS2 regions of the rDNA were performed using the ITS1 and ITS4 universal primers (18). Sequences of the two isolates were identical to one another except at one base pair and similar to (97% sequence similarity) but not identical with G. flava (AM181457) and G. obscura (AM181460) (BLASTN, NCBI 2.2.1.5). Thus, the Geosmithia isolated from black walnut in Colorado may be an unnamed species. Its origin has not yet been determined. Similarly, the identities of two isolates (917 and 1179) of F. solani based on morphological characteristics were supported by ITS sequencing results. Isolates 1217 (CBS 124663) and 1218 (CBS 124664) of Geosmithia and isolates 917 (CBS 124665) and 1179 (CBS 124666) of F. solani have been deposited in the Centraalbureau voor Schimmelcultures. One-year-old bare root black walnut trees approximately 100 cm in height and 7 to 12 mm diameter at ground level were used for pathogenicity tests. Dormant trees were planted in 3.8-liter pots in February 2008 in a commercial nursery mix and placed in a greenhouse. Inoculations were made in March after the trees had resumed growth and leaves had fully emerged. Two isolates each of Geosmithia (1217 and 1218) and F. solani (917 and 1179) were grown for 3 weeks on ½-strength PDA. Inoculations were made by slicing down through the bark with a sterile scalpel at three sites on each stem. Resulting wounds were approximately 0.5 to 1.0 cm wide and 1 cm long with the flap of bark still attached to the stem at the base of the wound. Wounds were made at approximately 15-cm intervals along the stem starting 15 cm above the soil line. A plug of sterile ½-strength PDA approximately 0.5 cm² was inserted under the bark flap and against the wood on the middle wound on each tree. An agar plug of similar size but colonized by one of the fungal isolates was then inserted under the bark flap on the top and bottom wound. Four trees were inoculated with each isolate. All wounds were sealed with Parafilm (American National Can, Menasha, WI) and the trees were randomly placed on a greenhouse bench. The Parafilm was removed after 3 weeks. After 8 weeks, all trees were harvested and the outer bark was shaved from the wounds with a sterile scalpel to expose the extent of bark discoloration. Wounds in which sterile agar was inserted were sealed by callus and there was no evidence of bark discoloration beyond the original wound. Cankers developed at all wounds inoculated with Geosmithia and at 38% of the wounds inoculated with F. solani (Table 1). Cankers caused by Geosmithia were both longer than those caused by F. solani and had more diffuse margins (Fig. 6). Both fungi were consistently isolated from the canker margins. Table 1. Canker formation in black walnut 8 weeks after inoculation with isolates of Fusarium solani and Geosmithia. * Two inoculation sites on each of 4 trees. Fig. 6. Canker development in Juglans nigra 8 weeks after inoculation with (A) Fusarium solani and (B) Geosmithia. An experiment was conducted to demonstrate that P. juglandis is a vector of Geosmithia. Ten adult P. juglandis beetles were collected as they emerged from a cankered black walnut log that had been placed in the laboratory. The beetles were transferred to a sealed plastic box containing a recently cut, 9.5-cm-long and 2.5-cm-diameter black walnut stem placed on a moistened paper towel. The cut ends of the stem were sealed with Parafilm to prevent moisture loss. The stem was collected from a healthy black walnut in a region of the state where thousand cankers had not yet become established. No cankers or beetle galleries were visible prior to beetle exposure. Within 24 h, beetles had begun to burrow into the stem. Geosmithia was subsequently isolated from frass pushed out of the tunnels. After 4 weeks the outer stem bark was carefully removed around the beetle galleries as previously described. Cankers similar to those observed on naturally infected trees had developed around the beetle galleries and Geosmithia was isolated from canker margins (Fig. 7). Fig. 7. Gallery and canker development 4 weeks after placement of adult walnut twig beetles emerged from Juglans nigra with thousand cankers disease in a cage containing a branch segment from a healthy black walnut. We report for the first time that an unnamed Geosmithia associated with the walnut twig beetle is a cause of a lethal canker disease of black walnut. Many Geosmithia species have been reported to be associated with bark beetles of hardwood and conifer trees (10,11,12,13). For example G. flava and G. obscura have been isolated from scolytid beetle galleries in several tree species in Europe (11,13). Geosmithia species have not previously been reported to cause cankers on trees although Čížková et al. (4) found that G. langdonii and G. pallida reduced stem growth of germinating seedlings of garden cress (Lepidium sativum L. var. capitatum). Several Fusarium species including F. solani have been associated with elongate, annual cankers of black walnut in North America (5,6,14,17) and English walnut in South Africa (3) although the epidemiology of these cankers is poorly understood. Trees are thought to be predisposed to canker formation by stress factors including suboptimal site conditions, improper pruning, and adverse weather (5,6,14). Kessler (9) and Weber (17) hypothesized that an apparent symbiosis between ambrosia beetles and Fusarium fungi resulted in canker formation on black walnut. Although we have observed ambrosia beetles in diseased black walnut wood in Colorado, we have not determined whether they are serving as vectors for F. solani. Carlson et al. (5) questioned whether F. solani was the primary cause of cankers on mature black walnuts and suggested it may be present only as a saprophyte or as a facultative parasite. We noted that trees exhibiting elongate trunk cankers already had extensive tunneling in the trunk bark caused by P. juglandis and Geosmithia was isolated from discolored tissue surrounding these galleries. Thus, we believe Geosmithia had already extensively colonized the bark and was the primary pathogen associated with walnut mortality. Nevertheless, F. solani was consistently isolated from the cambium and outer sapwood at the margins of elongate trunk cankers. This observation as well as our pathogenicity studies suggests a role, even if minor, for F. solani in tree mortality. We propose the name Thousand Cankers disease to describe this lethal disease of black walnut because trees are killed by the cumulative effects of numerous, coalescing twig, branch and trunk cankers that are associated with walnut twig beetle galleries. The speed at which this disease is eliminating black walnut along the Front Range of Colorado is alarming. We believe Thousand Cankers disease poses a grave risk to black walnut throughout its native range in eastern North America should the walnut twig beetle/Geosmithia complex be introduced. The distribution of Thousand Cankers disease and relative susceptibility of other native and exotic Juglans species to Geosmithia needs to be determined. 1. Blackman, M. W. 1928. The genus Pityophthorus Eichh. in North America: A revisional study of the Pityphthori, with descriptions of two new genera and seventy-one new species. Tech. Publ. 25. Bull. 1(3-6). New York State Coll. of Forestry, Syracuse Univ., Syracuse, NY. 2. Bright, D. E., and Stark, R. W. 1973. The Bark Beetles and Ambrosia Beetles of California (Scolytidae and Platypodidae). Bulletin of the California Insect Survey, Volume 16. Univ. of Calif., Berkeley, CA. 3. Chen, W., and Swart, W. J. 2000. First report of stem canker of English walnut caused by Fusarium solani in South Africa. Plant Dis. 84:592. 4. Čížková, D., Šrůtka, P., Kolařík, M., Kubátová, A., and Pažoutová, S. 2005. Assessing the pathogenic effect of Fusarium, Geosmithia, and Ophiostoma fungi from broad-leaved trees. Folia Microbiol. 50:59-62. 5. Carlson, J. C., Mielke, M. E., Appleby, J. E., Hatcher, R., Hayes, E. M., Luley, C. J., O’Brien, J. G., and Rugg, D. J. 1993. Survey of black walnut canker in plantations in five central states. North. J. Appl. For. 10:10-13. 6. Cummings, J. E., and Kuntz, J. E. 1986. Stem canker on black walnut caused by Fusarium sporotrichioides. 77th Annu. Rep. 85-92. North. Nut Growers. Assoc., Hamden, CT.
7. Furniss, R. L., and Carolin, V. M. 1977. Western Forest Insects. Misc. Publ. No. 1339, USDA-FS, Washington, DC. 8. Harlow, W., and Harrar, E. 1969. Textbook of Dendrology, 5th Edn. McGraw-Hill, New York, NY. 9. Kessler, K. J., Jr. 1974. An apparent symbiosis between Fusarium fungi and ambrosia beetle causes canker on black walnut stems. Plant Dis. Rep. 58:1044-1047. 10. Kolařík , M., Kostovčík, M., and Pažoutová, S. 2007. Host range and diversity of the genus Geosmithia (Ascomycota: Hypocreales) living in association with bark beetles in the Mediterranean area. Mycol. Res. 111:1298-1310. 11. Kolařík, M., Kubátová, A., Čepička, I., Pažoutová, S, and Šrůtka, P. 2005. A complex of three new white-spored, sympatric, and host-range limited Geosmithia species. Mycol. Res. 109:1323-1336. 12. Kolařík, M., Kubátová, A., Hulcr, J., and Pažoutová, S. 2008. Geosmithia fungi are highly diverse and consistent bark beetles associates: Evidence from their community structure in temperate Europe. Microb. Ecol. 55:65-80. 13. Kolařík, M., Kubátová, A., Pažoutová, S., and Šrůtka, P. 2004. Morphological and molecular characterisation of Geosmithia putterillii, G. pallida comb. nov., and G. flava sp. nov., associated with subcorticolous insects. Mycol. Res. 108:1053-1069. 14. Tisserat, N. 1987. Stem canker of black walnut caused by Fusarium solani in Kansas. Plant Dis. 71:557. 15. USDA Forest Service 2002. Forest Insect and Disease Conditions of the Southwestern Region, 2001. Forestry and Forest Health Publication R3-02-01. USDA-FS Southwestern Region, Albuquerque, NM. 16. USDA Forest Service 2005. Forest Insect and Disease Conditions of the Rocky Mountain Region, 2004. Renewable Resources and Forest Health Management Report R2-05-09. USDA-FS Rocky Mountain Region, Golden, CO.
17. Weber, B. C. 1974. An apparent symbiosis between Fusarium fungi and ambrosia beetles causes canker on black walnut stems. Plant Dis. 58:1044-1047. 18. White, T. J., Bruns, T., Lee, S., and Taylor, J. 1990. Amplification and direct sequencing of fungal ribosomal RNA sequences for phylogenetics. Pages 315-322 in: PCR Protocols: A Guide to Methods and Applications. Academic Press, San Diego, CA. 19. Wood, S. L., and Bright, D. E. 1992. A catalog of Scolytidae and Platypodidae (Coleoptera), pt. 2. Taxonomic Index, Vol. B. Great Basin Nat. Mem. No. 6. Brigham Young Univ., Provo, UT.